Who was Tecumseh and why was this Native Indian chief famous? Summary: Tecumseh was a famous Shawnee Indian chief who fought in Tecumseh's War and the War of 1812. His strategy to unite Native Indian tribes in resistance against US encroachment failed with the defeat of his brother, Tenskwatawa the Prophet at the Battle of Tippecanoe in 1811. Tecumseh was an ally of the British in the War of 1812. 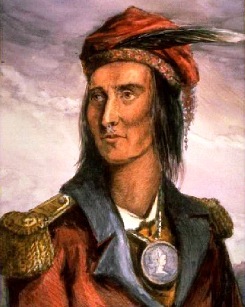 Tecumseh fought and died at the Battle of the Thames during the War of 1812. The following fact sheet contains interesting facts, background history and information about the life of Tecumseh and the events in history that led to his fame as a great Native American Indian leader.